In the direct-to-consumer economy, retailers are starting to think differently about how to build relationships with customers. And a lot of the time, it can be useful to look at startups over the past few years. There’s a definite strategy that most companies have applied in creating great connections. Personal branding can make or break a brand’s success. And it doesn’t need a team of marketers or global strategy to do it. The Fingerling, the sell-out toy of 2017, achieved success via a series of targeted social media campaigns. Clearly, the Fingerling team knew who their audience were and how to reach them. Geek, loser, teacher’s pet. These are all labels we’ve given or had given often without realising their harm. To combat the negative, and often “outdated and irrelevant” labels given to people, River Island have launched “Labels are for Clothes”. An important step to tackle body and confidence issues that the likes of Ashley Graham have achieved leaps and bounds for, with still quite a way to go. Inclusivity and diversity is also part of toy store The Entertainer’s strategy, as they recently held a daily quiet hour in-store for children with autism. Another big, and important, topic is environmental waste. With brands like Bulldog Skincare for Men developing bio-disposable sugarcane packaging, ensuring minimal environmental impact and long-time do-gooders Lush continuing to drive ethics in the UK health and beauty market. Gone are the days of shoppers sticking to one store or selected brands. In the UK, as discount chains such as Aldi and Lidl thrive, supermarkets and brands must strive to do so much more than provide a product. In response, Co-Op has started its Eat Together campaign that aims to “bring people together through food” using product placement as part of its strategy. Meanwhile, Deliveroo has launched its “Eat Amazing” campaign to encourage people to use the app more often. Consumer awareness has led to the rise of the ‘flexitarian trend’ with brands such as Quorn reaping the benefits. But it’s not all about the branding – customer satisfaction mustn’t be forgotten. McDonald’s CEO Steve Easterbrook recently credited the company’s best sales figures in six years to both brand and operation focus: “brand perception and operational metrics go hand.” In addition to the tech innovation and modernization of the restaurants themselves, McDonald’s invested in their people and menu improvements to “head in a direction our customers want us to,” leading to a sales increase of 5.5% in Q4’17 and 0.3% for all of 2017. 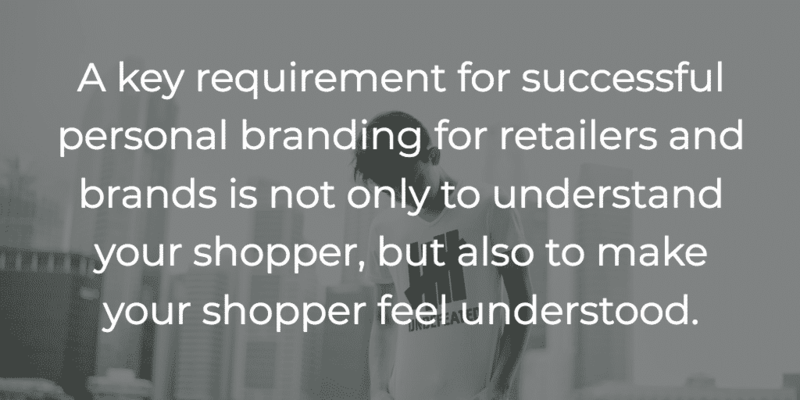 If a key result of personal branding is the expression of skills and values, then a key requirement for successful personal branding for retailers and brands is not only to understand your shopper, but also to make your shopper feel understood. By delivering your product or service in the right way, with the appropriate messaging, at the right time, you can act on your best channels to reach your specific shopper and drive loyalty and ultimately, sales.